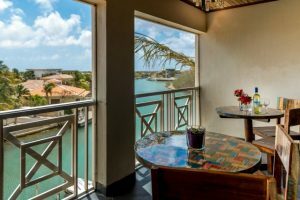 Choose from 3 vacation rental apartments all centrally located at Caribbean Court Bonaire. The cheerful Sunny Yellow Apartment is a one bedroom one bathroom holiday rental apartment with a fully equipped kitchen and tropical style rattan and teak furniture. Marble flooring throughout the apartment – pretty and airy. For your comfort an air conditioner and ceiling fan in the bedroom and mosquito screens on the windows and doors in both the living room and bedroom. The kitchen is fully stocked with dishes, utensils and pots and pans, everythingyou need to eat in with ease. 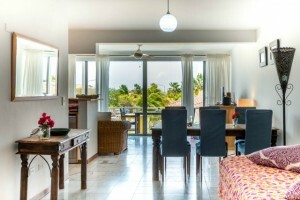 Sunny Yellow Apartment is the whole package for a very comfortable, very pleasant Bonaire vacation. full kitchen with dishwasher, microwave, four burner stove, coffee maker, blender, toaster, etc. 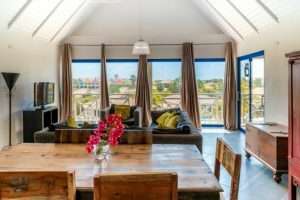 Spacious, tastefully renovated 2-3 bedroom, 2 bathroom holiday rental apartment with a bright wall of windows, Italian ceramic tiles, cathedral ceilings – pretty and airy. 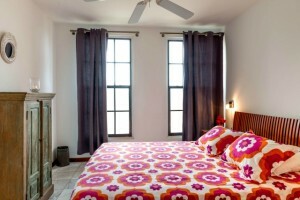 For your comfort both lower level bedrooms are air conditioned and the entire apartment is fully screened-in. Prepare meals in your stocked kitchen – we tried to think of every type of kitchen gadget and utensil you’ll may need or want to prepare meals like you would at home. 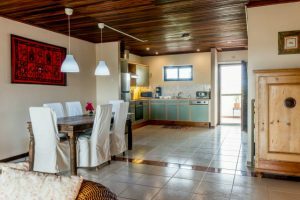 Breezy Loft is comfortable for a couple who may wish to only use one bedroom but also perfect for families or a group of two couples traveling together on their Bonaire scuba or surf vacation. bed set-up: First bedroom has a king bed, Second bedroom has a king and a twin bed and an ensuite bathroom and the upstairs sleeping loft 2 twin beds. full kitchen with 4 burner stove, coffee maker, blender, toaster, etc. The moment you walk into this spacious one bedroom one bathroom top floor vacation rental you feel the breeze and you feel relaxed. Blue View is your home away from home. Spend hours relaxing on the hammock on the screened-in terrace or sipping a glass of wine while using your (OWN) wifi connection to make friends back home jealous. The large bedroom is comfortably air-conditioned and has screens to keep the mosquitos out. And although the terrace is screened in and breezy there is also a ceiling fan for days when the tropical breezes are more tropical and less breezy… The kitchen is fully stocked with dishes, utensils and pots and pans so you can eat in when you want or just heat up some leftovers from your favorite Bonaire restaurants.